I have been using ShareASale for a few years now. At first I didn't really get it and barely made any money, but then I discovered that they just aren't for affiliate marketing. You see, certain merchants send out bonus posts from time to time and although they don't pay that much money, it's usually a simple copy/paste and you can make $5-$10. Not much, I know, but do 10 of these a month and you're at $50-$100, PLUS sales from anyone clicking on your affiliate links. I've been able to make about $50 a month from ShareASale. So it's not huge money, but money is money right? Below I have a list of some of the merchants that put out bonus posts often (you've seen them all posted here on the blog, I know!!) and other easy ways to earn money! The ones that say Referral Bonus? Means they will pay you that amount for anybody who signs up under you. So if you sign up under one of my links, I will make the amount listed. If someone signs up under your link, you'll make that money! 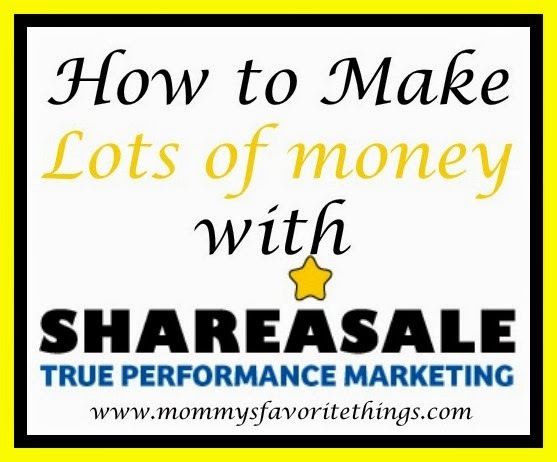 This is probably the fastest way to earn money with ShareASale. $15 Referral Bonus from 3/19-3/26!!!! NOT ONLY CAN YOU EARN MONEY FROM REFERRALS AND BONUS POSTS, BUT A LOT OF THESE MERCHANTS OFFER GREAT COMMISSION ON ORDERS PLACED THROUGH YOUR LINK AS WELL!! I HAVE MOST OF THESE LINKS UNDER MY SHOP TAB, IT'S A GREAT WAY TO EARN A FEW BUCKS!! Thanks, I wasn't a part of a few of these affiliates! This is very informative. However, is there a way you can show me how to get our affiliate links to have others sign up as an affiliate and get paid for them doing it? Crystal, I hope you see this message, I will also try and email it to you! Log in to your account, then click on links and then get a link/banner. Under each merchant it says Get Links, click on that and then click on two tier text links. Then click on Get HTML Code and copy the shortest code available. Some merchants don't have these codes. They most likely don't do a referral bonus!